Here is another popular South Indian breakfast item. 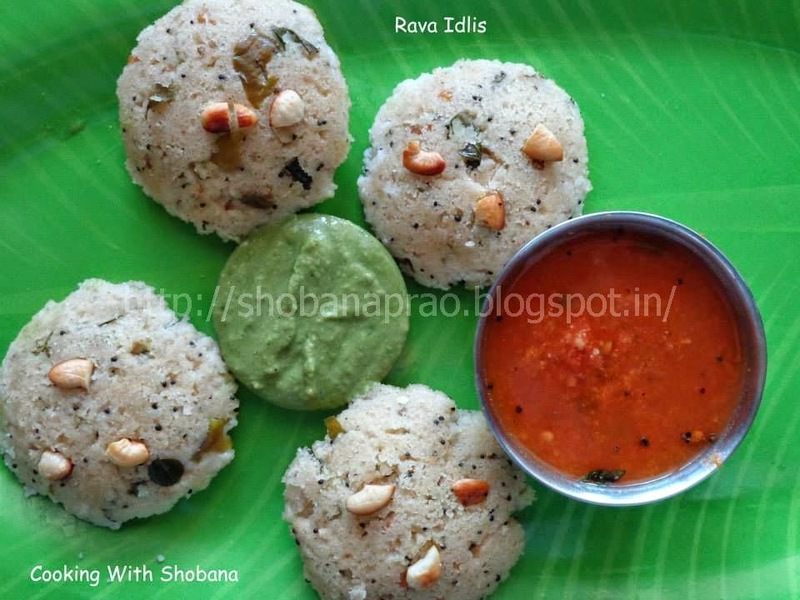 Today I am sharing my recipe for rava idlis. The best part of this preparation is that it can be made fast as the batter need not be fermented overnight etc. By the way, two other types of idlis which do not require any soaking of the ingredients or fermentation of the batter are Oats Idli and Vermicelli Idlis. While some choose to keep the ratio between curds and rava as 1: 1, I prefer to have a ratio of 1: 2, as given below. In a thick-bottomed kadhai, heat oil and when it gets sufficiently heated add the rava. Stirring continuously roast it on medium flame till you get a good aroma and the rava changes colour. Next, fry the cashewnuts and keep aside. Then do the seasoning by adding mustard seeds, and when they splutter add chana dal, curry leaves and hing. Fry till the dal changes colour. In a pressure cooker, steam the idlis for 10-12 minutes, without using the weight. Serve hot with sambar and chutney of your choice.